In April 2017, the personnel of Nissan Europe SAS moved to a bigger and more modern building in the city of Montigny, near Paris. The building has more than 12 000 square meters of office area, 800 workstations, 500 parking spaces and about 100 EV charging stations. The maximum electrical consumption of the site is a bit more than 2 MW. 6 Power Converters produced by ABB developed in the framework of the ELSA project - the converters are 24 kW each forming a 144 kW system. Each converter manages 2 batteries. The installed Converters are a pre-commercial version first tested at this pilot site. One of the main objectives of this pilot site was testing the scalability of the ELSA system. What is the special focus of the ELSA pilot site at the Nissan Europe Office Building? The Nissan pilot site will focus on testing the battery inverters developed in the scope of ELSA. The main focus will be on the system scalability, i.e. working with a number of inverters in parallel and validating the communication between the units and the Energy Management System. You are trialling the application of the ELSA battery storage system at building level. 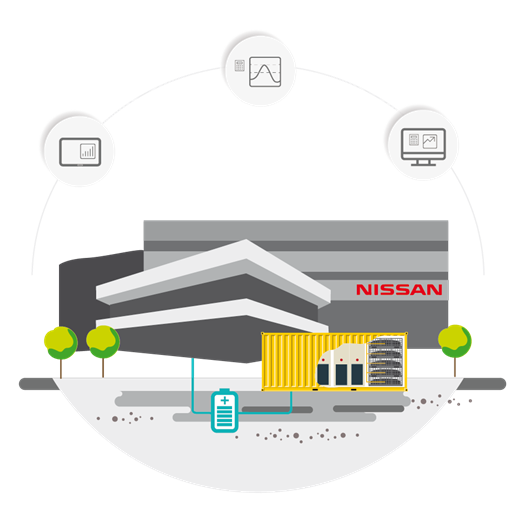 Which services is the ELSA battery storage system providing at the Nissan Europe Office Building? Peak shaving – using the batteries in periods of peak electricity consumption, minimizing the power taken from the grid. This allows to decrease the cost of the power supply. We expect to lower the price of the Energy Storage System by developing the power electronics system based on existing technology and "on the shelf” components and also by using 2nd life batteries. We expect that we will be able to validate the economic viability of the Energy Storage System by reducing the electricity bill and by creating value through providing services to the grid (e.g. provide flexibility to an aggregator for balancing services). Furthermore, the use of second life batteries will improve the environmental footprint of the batteries and the EVs.